Weekends sometimes demand fancy, special-occasion, I-cooked-all-afternoon-because-it’s-Saturday fare. And sometimes just the opposite. This recipe is dedicated to a Sunday spent doing better things, like collecting sticks outside with the kids for hours, or reading by yourself all afternoon to the exclusion of any other activity whatsoever. If you saved some batter from making sweet potato pancakes for the kids this morning, you’re ahead of the game for a simple dinner tonight. If not, go ahead and whip some up now, it won’t take long. While you’re doing that, put a washed and torn bunch of kale in a pot with an inch of water and a teaspoon of salt to simmer until tender, about 5 minutes. Start warming your griddle now for the pancakes. Drain the kale well, toss it into a hot pan with a touch of olive oil and sautee it for a few minutes. I recommend a splash of fish sauce at this point, but you could just salt it to taste instead. 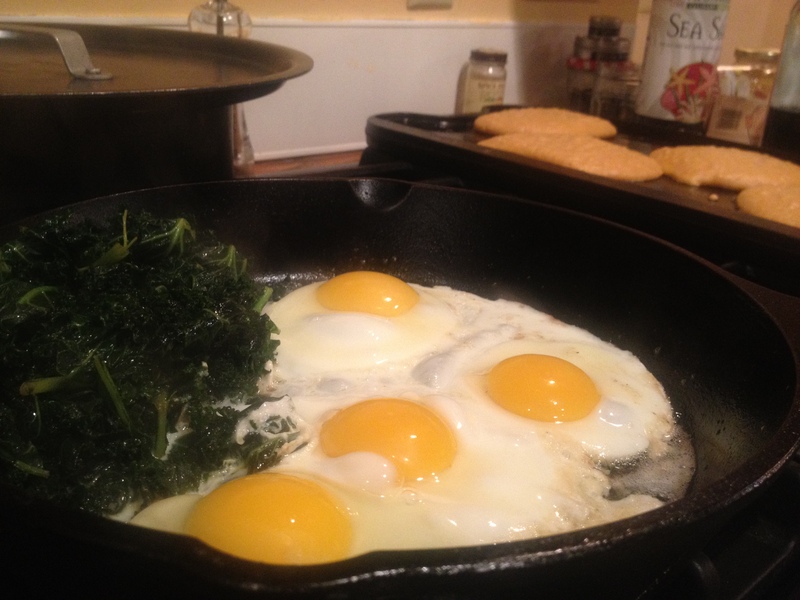 Then smoosh the kale over to the side of the pan, where it will work on getting some crispy edges while your eggs are cooking (don’t forget to turn the greens occasionally with a tongs). Lower the heat in the pan, add some oil or butter to the now-empty part, and crack in your eggs. 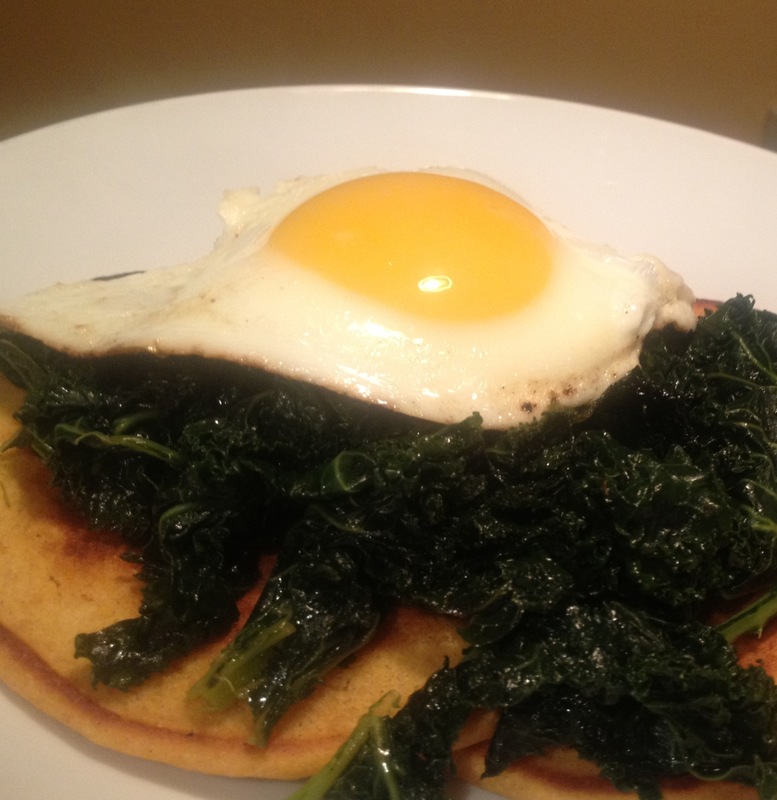 Let the eggs cook to your liking while your pancakes bake, then pile everything at once onto a plate: sweet potato pancakes, then kale topped with a soft egg. Serve with, no joke, maple syrup and your favorite hot sauce. This entry was posted in Breakfast, Eggs and tagged breakfast, cooking, dinner, food, kale, lifestyle, recipes, vegetarian on January 28, 2012 by emmycooks.